The top 10% of spring and winter milk producers generated a net profit of €3,255 and €3,422/ha respectively in 2014, according to Dr Tom O’Dwyer, Head of Dairy Knowledge Transfer in Teagasc. He was speaking following the publication of Teagasc’s e-Profit Monitor analysis of Dairy Farms in 2014. O’Dwyer said while farmers completing the Teagasc e-Profit Monitor programme are not representative of the national average, they do tend to be more financially focused, generating almost 30% more profit per hectare. He said the analysis shows that similar to other years, spring and winter milk producers generate similar net profit per hectare (€1,806 and €1,928 respectively). However, he said the top 10% of spring and winter milk producers generated a net profit of €3,255 and €3,422/ha respectively. Another key finding of the analysis was with milk quota abolition imminent, changing the focus towards profit per hectare rather than profit per litre could increase profitability on a 40ha dairy farm by €18,000. 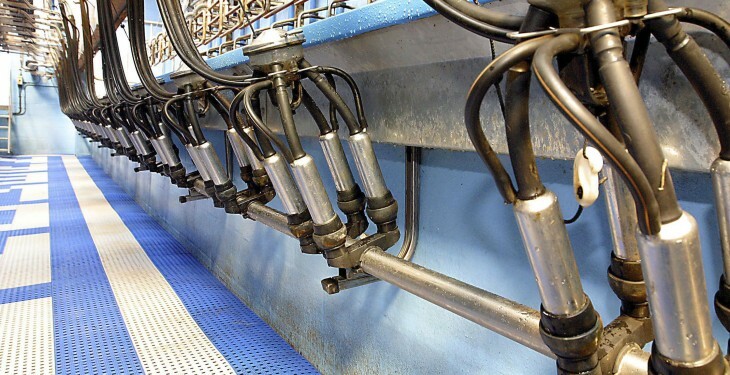 While milk quotas were in place, maximising profitability per litre was the focus on farm because milk quota was the first limiting constraint. 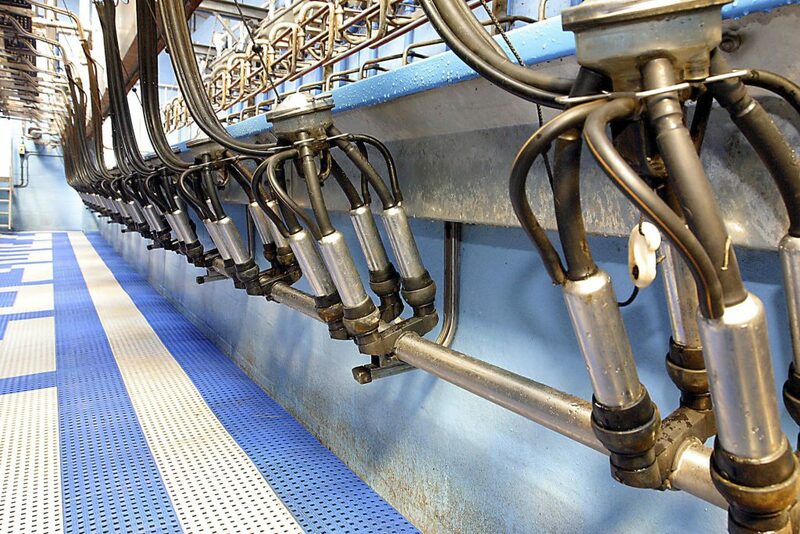 With the abolition of milk quotas, land becomes the first limiting constraint changing the emphasis from maximising profit per litre to maximising profit per hectare. 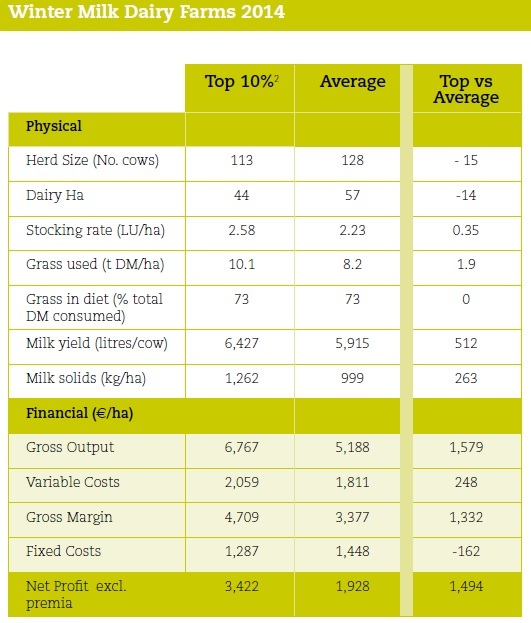 In summary the analysis of the top performers from over 1,360 spring milk farms, found that the top net profit per hectare farms had similar herd sizes but were 15% more intensively stocked (2.66 LU/ha); utilised 15% more grazed grass (11.2 t DM/ha); and milk solids production per hectare was 35% higher (1,176 kg/ha). Teagasc Dairy Specialist George Ramsbottom said the top performing farmers were able to increase their profits without significant increases in their costs. “Production costs per litre were just 1c/L higher on the high profit per hectare farms. The highest profit per hectare farms still managed to retain €464/ha of the €1,147 extra gross output generated. This is worth over €18,500 in extra profit for a 40ha dairy farm,” he said. According to Ramsbottom grass utilisation remains the key to generating higher profits in spring-based milk production systems. “In 2014, even though the price paid for milk was relatively high, ‘grass rich’ systems of milk production – those using the highest proportions of home grown grass, were almost €200/ha more profitable than ‘grass poor’ farms,” he said. Teagasc Financial Specialist, Kevin Connolly also reported in the analysis that a matched sample of suppliers who completed the Teagasc e-Profit Monitor between 2008 and 2014 inclusive, had grown the scale and intensity of their dairy herds by 22% to 84 cows per farm and by 5% to 2.20 livestock units per hectare respectively. 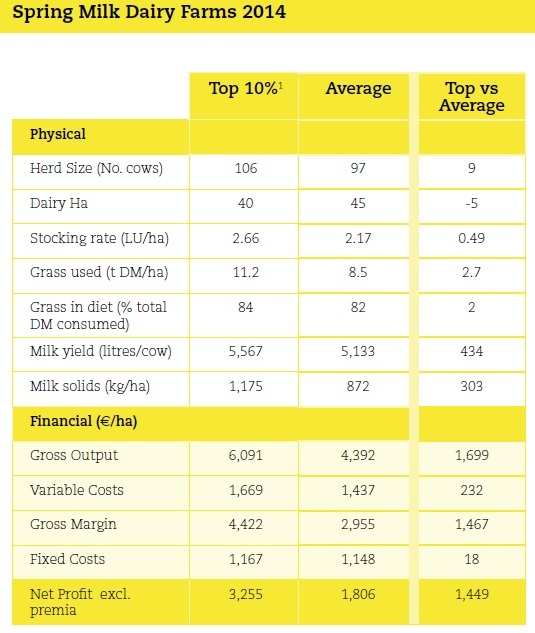 In nominal terms, he said, net profitability per hectare was similar while profitability from the dairy enterprise had grown by 16% between 2008 and 2014. Adjusted for constant milk price and agricultural input price inflation, Connolly said profitability had grown by 11% over the period.